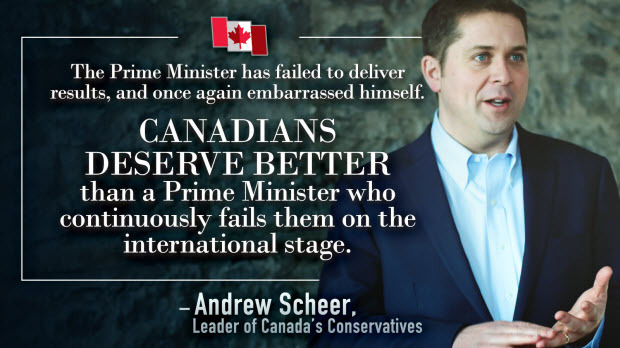 “Canada’s Conservatives support efforts that grow our economy and create good, well-paying jobs, but unfortunately Justin Trudeau is failing to take international trade missions seriously. “Instead of working with his Indian counterparts to secure vital market access for our Canadian farmers, manufacturers and small businesses, the Prime Minister prioritized photo-ops and used taxpayer dollars to fly a celebrity chef halfway around the world to serve his Liberal friends. “I was also shocked to learn that Justin Trudeau spent taxpayer money wining and dining an attempted murderer during his visit. “Trudeau’s special guest was Jaspal Atwal, who was convicted of trying to murder an Indian cabinet minister in Canada in 1986. Mr. Atwal was a member of a terrorist organization that is banned in Canada. It is outrageous to think that that didn’t stop Justin Trudeau or any other senior Liberals from posing for photos with Mr. Atwal, and inviting him to official events. “If the Prime Minister had been serious about this trade mission, he would have brought his Minister of Agriculture to India to ensure that our farmers are protected from crippling tariffs on Canadian exports to India.